You will have a need to practice deep breathing once you are widowed. Deep breathing is a wonderful way to calm the nerves when you are feeling overwhelmed. The grief monster wants you frazzled, he wants your nerves on edge and he wants you on the verge of a meltdown. When you feel like you just can not take it anymore. Get away and do some deep breathing exercises. Here is a link to an article from Dr. Andrew Weil about 3 deep breathing exercises. Unlike tranquilizers, they will improve the quality of your life the more you do them. I came across a brief prayer from Wendy van Eyck recently that I say every morning and when stressed out. Say these words while focusing on deeply inhaling and exhaling. Repeat as necessary. Develop your own breathing rhythm when saying these words. I’ve been doing this for almost a month now and it does work. While I am not totally calm, cool and collected, these words and deep breathing have helped soothe this savage beast’s soul and restored my cheer. 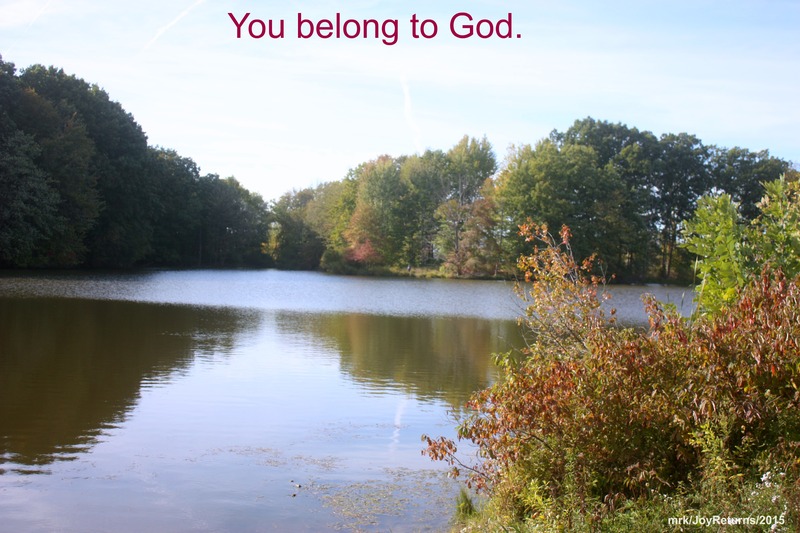 When the going gets tough, take deep breaths and know that you belong to God. A God who is with you during your grief journey and who has overcome the world.